With an oink oink here and an oink oink there, this little piggy went to market and brought you back coins not magic beans. 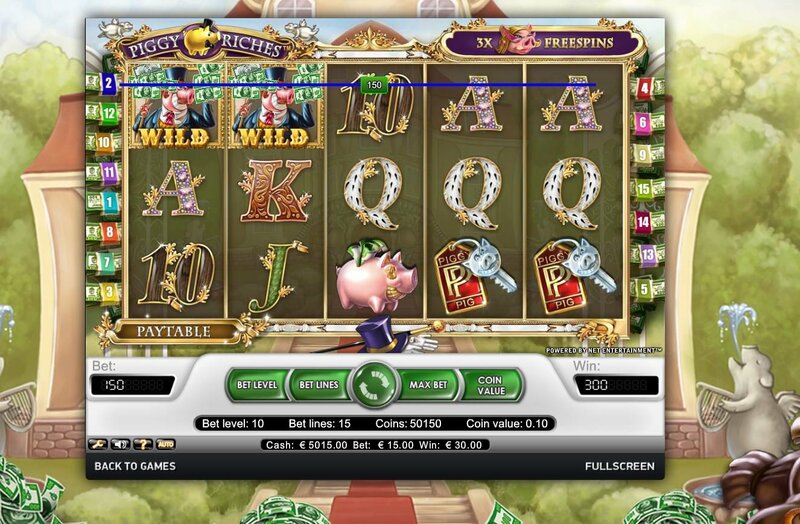 Win up to 360,000 coins with Piggy Riches slot game. 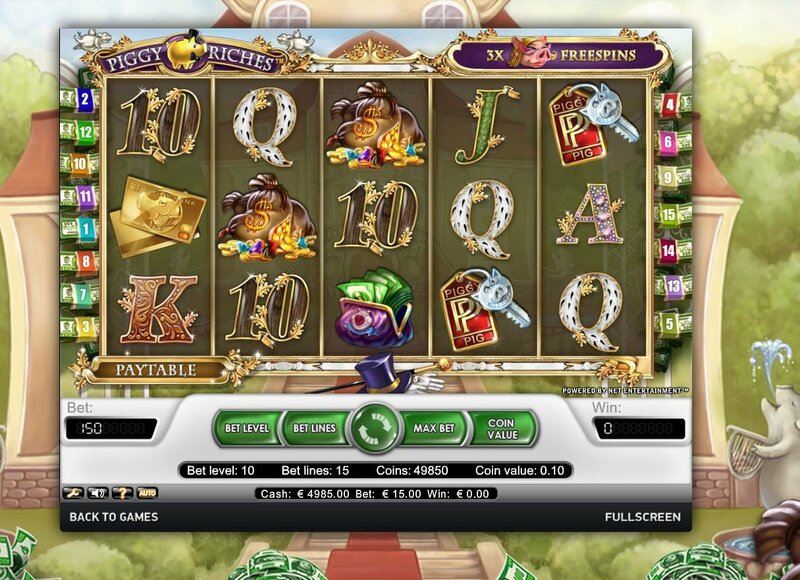 This 5 reel, 15 pay line is a multiple coin video slot and has up to 10 bet levels. You've got poor piggy with a slit in his side to honour the time old tradition of a piggy bank, keeping your riches from prying eyes, plus a range of other fabulous piggies to play with. Hit the wild card, a piggy in a top hat, throwing his cash up into the air and hear the music go wild! Scatter piggy is a dolled up bird with a face like a pig, holding a gift for you with her feather boas and elegant green elbow gloves. Her oink when she graces your screen is most unladylike. The graphic opulence aside, there really isn't so much going on with Piggy Riches bonus games - there basically aren't any. You have the graceless Miss Piggy Rich throwing you up to 28 free spins when you stumble upon 3 or more of her scatter symbols and that's all that is up for grabs here. Perhaps Netent thought the gripping graphics would be enough to hold this slot aficionados affection. Hit the wild card, a piggy in a top hat, throwing his cash up into the air and hear the music go wild! 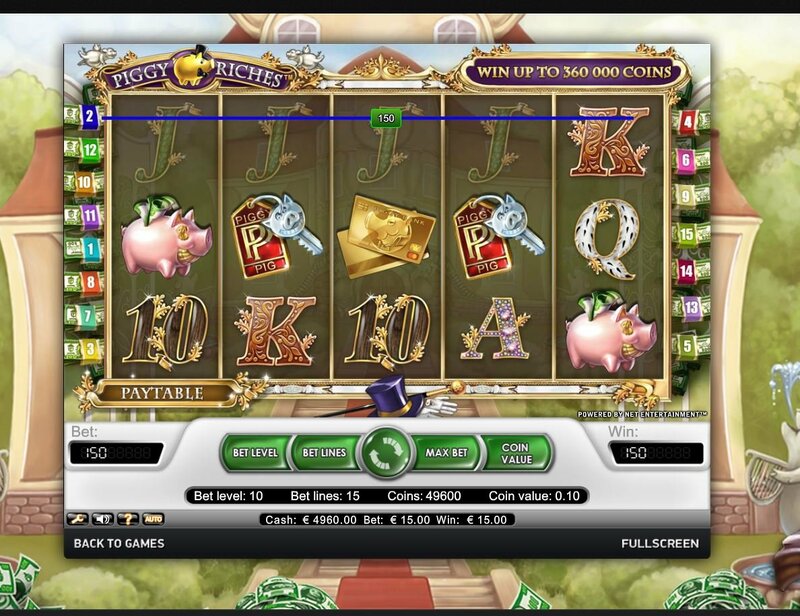 There isn't much to Netent's Piggy Riches, apart from the great graphics and coinage available, there is Netents usual settings allowing you t0 customise your playing experience. After playing slots on a whole host of different software providers, I can say they are nothing to be sniffed at. I can choose from between 10 and 100 auto spins whilst I sit back and take a roll in the mud.